Hot off the press is this divine 2009 calendar by Marisa Haedike (Creative Thursday) which was released on Etsy today. Marisa is a hugely talented artist and from LA who creates gorgeous tiny characters in her work. You'll have to be quick to score one of these calendars as they are a limited edition print of 220 and at a great price point ($USD38). 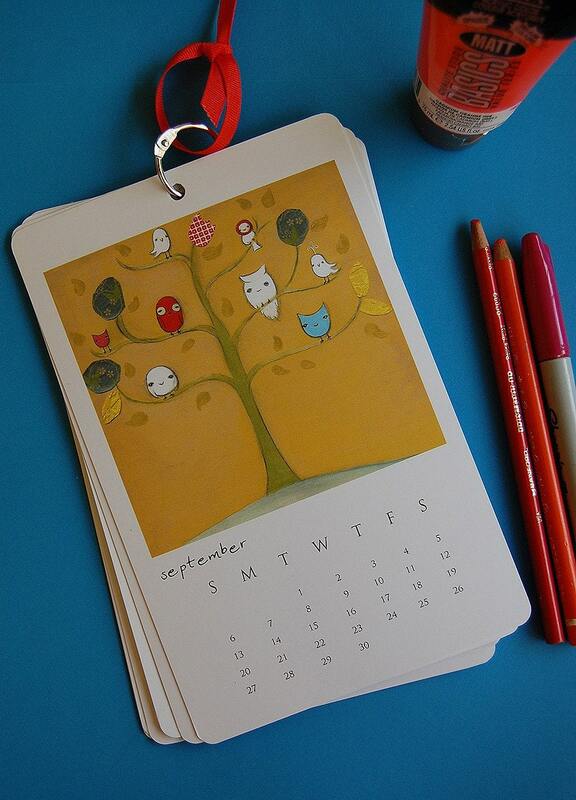 The calendars are offset printed on heavy card stock with a matte finish and bound with a silver ring and sweet ribbon for hanging. I'll be rotating the cards out of the calendar and into frames for the wall as soon as each month is over! Buy online here. Thanks so much Steph! I appreciate all your support and "spreading the word" all the way to Australia! My pleasure Marisa! Great timing for Christmas.